The Oromo conflict was an armed conflict between the Oromo Liberation Front (OLF) and the Government of Ethiopia. The conflict began in 1973, when Oromo nationalists established the OLF and its armed wing, the Oromo Liberation Army (OLA). a Alleged by the government of Ethiopia. The Oromo people are an ethnic group that mainly inhabit Ethiopia, with communities in neighbouring Kenya and Somalia as well. 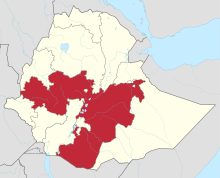 They are the largest ethnic group in Ethiopia and the wider Horn of Africa; according to a 2007 census, they make up about 34.5% of Ethiopia's population, and others estimate that they make up about 40% of the population. In 1967, the imperial regime of Haile Selassie I outlawed the Mecha and Tulama Self-Help Association (MTSHA), an Oromo social movement, and conducted mass arrests and executions of its members. The group's leader, Colonel General Tadesse Birru, who was a prominent military officer, was among those arrested. The actions by the regime sparked outrage among the Oromo community, ultimately leading to the formation of the Ethiopian National Liberation Front in 1967 and the Oromo Liberation Front in 1973. In 1973, the Ethiopian military ousted the imperial regime and seized control of the country. The new regime promptly arrested Oromo leaders; subsequently, the Oromo Liberation Front (OLF) was formed during a secret conference attended by Oromo leaders, including Hussein Sora and Elemo Qiltu. A group of armed Oromo fighters in the Chercher Mountains were adopted as the OLF's armed wing, the Oromo Liberation Army (OLA). In 1974, the OLA increased its activities in the Chercher Mountains, prompting the Ethiopian regime to send its military to the region to quell the insurrection. In June 1974, General Tadesse Birru, an Oromo nationalist who had been arrested by the imperial regime in 1966 along with other high ranking military officers, escaped from house arrest and joined Oromo rebels led by Hailu Regassa in Shewa. Birru and Regassa were later captured and executed by the Derg regime. In late August 1974, an OLA unit came down from their stronghold in the Chercher Mountains and made their way closer to Gelemso, hoping that nearby fully grown crops would be able to hide them from Ethiopian soldiers as they advanced towards other nearby towns. Three of the unit's new recruits were unaccustomed to climbing long distances, so they spent the night around the bottom of the mountains, while the rest of the soldiers camped at the top. When an OLA soldier was sent to retrieve the three recruits, it was discovered that they had been killed by Ethiopian militiamen who had followed the unit to Tiro. A large group of Ethiopian policemen and militiamen surrounded the OLA position in the mountains, and the two opposing groups began to exchange gunfire. A group of Ethiopian soldiers led by General Getachew Shibeshi later arrived, and began to shell the stronghold with mortar rockets, killing most of the OLA's members, including Elemo Qiltu. The event became known as the Battle of Tiro. Contingents of the OLA continued to fight the regime after the battle and later gained a massive influx of recruits and volunteers after the Derg regime executed Tadesse Birru and Hailu Regassa. In 1976, the OLF established a stronghold in the Chercher Mountains and began reorganizing itself. A congress was created by Oromo leaders, which revised the 1973 OLF Political Program and issued a new detailed program. The program called for the "total liberation of the Oromo nation from Ethiopian colonialism". The conference is now known as the Founding Congress, and marked the beginning of modern Oromo nationalism. In the 1980s, the OLF estimated that they had over 10,000 soldiers. They were poorly equipped in comparison to other rebel groups in Ethiopia at the time, such as the Eritrean People's Liberation Front (EPLF) and the Tigrayan People's Liberation Front (TPLF). The OLF also opened an office in Sudan in the 1980s, after its office in Somalia was closed down. During the 1980s, the government of Ethiopia was accused of using scorched earth tactics, such as burning down entire villages and massacring inhabitants. The OLF also lost several prominent members due to government ambushes and heavy fire; the secretary general of the OLF at the time, Galassa Dilbo, was nearly killed in one such ambush. In the early 1990s, the Derg regime began to lose its control over Ethiopia. The OLF failed to maintain strong alliances with the other two big rebel groups at the time; the Eritrean People's Liberation Front (EPLF) and the Tigrayan People's Liberation Front (TPLF). In 1990, the TPLF created an umbrella organization for several rebel groups in Ethiopia, the Ethiopian People's Revolutionary Democratic Front (EPRDF). The EPRDF's Oromo subordinate, the Oromo Peoples' Democratic Organization (OPDO) was seen as an attempted replacement for the OLF. In 1991, the EPRDF seized power and established a transitional government. The EPRDF and the OLF pledged to work together in the new government; however, they were largely unable to cooperate, as the OLF saw the OPDO as an EPRDF ploy to limit their influence. In 1992, the OLF announced that it was withdrawing from the transitional government because of "harassment and [the]assassinations of its members". In response, the EPRDF sent soldiers to destroy OLA camps. Despite initial victories against the EPRDF, the OLF were eventually overwhelmed by the EPRDF's superior numbers and weaponry, forcing OLA soldiers to use guerrilla warfare instead of traditional tactics. In the late 1990s, most of the OLF's leaders had escaped Ethiopia, and the land originally administer by the OLF had been seized by the Ethiopian government, now led by the EPRDF. After the Eritrean–Ethiopian War, the OLF moved its leadership and headquarters to Eritrea. The OLA allegedly began receiving military training and arms from the Eritrean government. On 25 July 2000, OLF and IFLO signed a peace agreement after five days of negotiations, thus ending 20 years of inter-factional fighting. In 2004, the Gambela Region-based Ethiopian Unity Patriots Front (EUPF) rebel group launched forays into Oromia with the help of Eritrea. These raids were only limited in scope, however, as the EUPF had no popular support among the Oromo people, despite having some Oromo members. In 2006, the OLA in southern Oromia retreated into Kenya in an attempt to regroup. That same year, Brigadier General Kemel Gelchu of the Ethiopian military took 100 of his soldiers and joined the OLF in Eritrea. Despite initially aiding the OLF as leader of its military wing, in 2008, General Kemel Gelchu took matters into his own hands and announced that the OLF would lay down its weapons and abandon its previous goal of seceding Oromia and instead work as a political party to democratize Ethiopia. Along with this announcement, he commanded OLF soldiers in south Oromia to lay down their weapons and surrender to the government. On 30 May 2015, various media outlets reported that the OLF had attacked a federal police station in the Ethiopian side of Moyale town killing 12 Ethiopian soldiers. This occurred weeks after Ethiopian forces swarmed across the Kenyan border and began absuing locals of Sololo town looking for OLF troops. These forces later responded to the attack by launching an attack on Moyale District Hospital and killing one guard. A roadside bomb struck a minibus traveling through a village in the Benishangul-Gumuz Region on 18 December 2018, killing ten civilians and injuring one. The police blamed the attack on the Oromo Liberation Front. ^ a b WRITENET (2004), p. 8. ^ Iaccino, Ludovica (26 February 2016). "Ethiopia claims Eritrea behind Oromo protests but activists warn against 'state propaganda'". International Business Times UK. ^ "Ethiopia Alleges Oromo Protesters Receiving Support From Egypt". Bloomberg. 10 October 2016. ^ Shaban, Abdur Rahman Alfa (7 August 2018). "Ethiopia govt agrees peace deal with Eritrea-based 'ex-terror' group | Africanews". Africanews. Retrieved 12 August 2018. ^ "Ethiopia Military Strength". Retrieved 27 October 2014. ^ Schmid & Jongman, 2005: 538-539. ^ a b Gérard Prunier. "Armed Movements in Sudan, Chad, CAR, Somalia, Eritrea and Ethiopia". ZIF Analysis. Addis Ababa, febrero de 2008, pp. 13-14. ^ "Country report and updates Ethiopia". War Resisters' International. Entre 1974 y 1990 murieron 300 000 soldados etíopes y 230 000 entre enero y mayo de 1991. ^ Triulzi, Alessandro (1996). Being and Becoming Oromo. Sweden: Gotab. ISBN 91-7106-379-X. ^ Anthony Appiah; Henry Louis Gates (2010). Encyclopedia of Africa. Oxford University Press. p. 433. ISBN 978-0-19-533770-9. ^ Adejumobi, Saheed (2007). History of Ethiopia. United States of America: Greenwood Publishing Group. p. 112. ISBN 0-313-32273-2. ^ a b c d e f g "The Birth of the Oromo Liberation Front". ^ a b c "Insurrection and invasion in the southeast, 1963-78" (PDF). ^ a b "ARREST OF OROMO INSURGENT LEADERS". Wikileaks. 1975-03-14. ^ a b "2004 Interview with Dhugassa Bakako, survivor of the Battle of Tiro". 2004. ^ a b c d Evil Days: 30 Years of War and Famine in Ethiopia. United States of America: Africa Watch. 1991. ISBN 1-56432-038-3. ^ a b "Interview with Chairman of the Oromo Liberation Front". ^ "Chronology for Oromo in Ethiopia". ^ "Genocide against the Oromo people of Ethiopia?". ^ "Statement of the OLF regarding new faction" (PDF). OLF. ^ "Oromo groups agree a common front". IRIN. 4 August 2000. Retrieved 26 February 2018. ^ "Ethiopian commander joins rebels". BBC. 10 August 2006. ^ "Kemal Gelchu's faction of OLF clarifies position on Ethiopian Unity". Ethiopian Review. January 2, 2012. ^ "As separatists in Ethiopia disarm, a new chapter for D.C.'s Oromo community". Washington Post. April 1, 2012. ^ "OMN/SBO - Gootichi WBO Zoonii Kibbaa Mooraa Waraana Wayyaanee Magaalaa Moyyaalee Haleeluun 17 Ol Hojiin Ala Gochuun Injifannoo Galmeesse". Retrieved 2015-05-31. ^ "OMN: Amharic News May 30, 2015". Retrieved 2015-05-31. ^ "Guard killed as Ethiopian fighters storm border post". Standard Digital News. Retrieved 2015-05-31. ^ "Bomb explosion kills 10 in Ethiopia". www.theeastafrican.co.ke. Retrieved 2018-12-18. ^ "Ten killed in Ethiopian blast". www.news24.com. Retrieved 2018-12-18. "ETHIOPIA: THE GAMBELLA CONFLICT– STRUCTURES AND PROGNOSIS" (PDF). WRITENET. August 2004.